Geek Girls Rule! 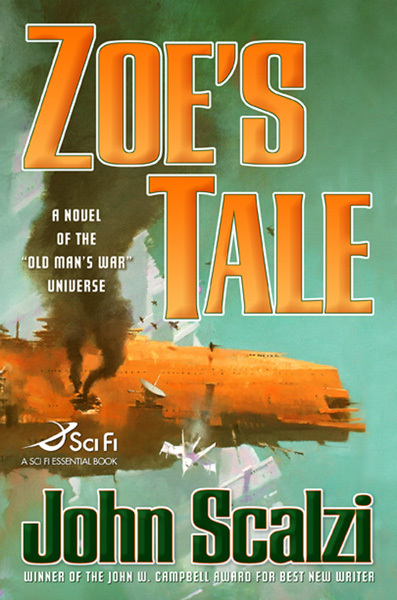 #178 – Review of Zoe’s Tale by John Scalzi – Geek Girls Rule!!! I could definitely see myself reading this again. Yes, I’m skipping the middle two books. Suffice it to say that both The Ghost Brigades (A Sci Fi Essential Book) and The Last Colony are excellent books, and necessary to understanding Zoe’s Tale . Well, here’s a brief overview. The Ghost Brigades set up the events that take place in Last Colony, and introduce us to Zoe. Zoe’s Tale and Last Colony cover the same events, but from different perspectives. In Last Colony, we follow John Perry through the events, Zoe’s Tale let’s us see those same events through the eyes of Zoe, who is 16 or 17 at that time. The reason my buddy Chris loaned me these books in the first place, is Zoe’s Tale. I think it happened fairly soon after I reviewed the collection of Murray Leinster short stories, and was full of hate for SF/F that had bad female characterizations in it. And, because of other things I was reading and a bunch of other nonsense going on, those books sat on my desk for over a year. Finally, because I’d started reading John Scalzi’s blog, I decided to give them a chance. As you know, I loved Old Man’s War and leapt immediately into Ghost Brigades. I tore through that one as well, and then Last Colony, in rapid succession. He told me that Zoe was an excellently portrayed female character, and he thought I’d like the series. I did like the series. A lot. And Zoe is fairly well done. However, no matter how close someone who wasn’t a teenaged girl gets to a good portrayal of a teenaged girl, there still winds up being those things that just sound off to those of us who were. For starters, Zoe spends a lot of the book being far too self-aware. Teenagers of all genders are far more self-centered than self-aware. While most of her interactions with Gretchen are really good, they do occasionally veer into the cartoon-ish. Honestly, for someone who never was a teenaged girl, this is a damn fine characterization. He does mostly avoid the cartoon-ish, and he allows her a great deal of depth, probably more then most teen girls are actually capable of. Granted, Zoe has had an exceptional life, even by the standards of Scalzi’s universe. I enjoyed the book a great deal, with a minimum of eye-rolling. I think this is probably as close to an accurate portrayal of teenaged girls as anyone who has never been one is going to get. Seriously, it’s a great portrayal, and it builds and adds to the Last Colony storyline in a way that doesn’t leave you feeling as if it’s just a rehash. The insights and extra adventures that Zoe brings to the story are interesting and important. She’s a smart, capable girl and resourceful. She’s caring and tender. I think she has a far better grip on her emotions than most actual teenaged girls, but that’s easily explained by the presence of the Obin, and her desire not to distress them. You honestly like Zoe. I think there was a definite lack of your average teenaged brattiness that could have been brought to the fore more. I mean, yes, unusual circumstances, but there’s still that boundary testing that goes on in the teen years. And while, yes, it makes rational sense that she knows she has to do these things, more resistance would be more realistic. Teenagers of all genders are not rational beings, not all the time anyway. I think Scalzi’s depiction of Magdy and Enzo were pretty spot on, and given that he’s been a teen boy, that makes total sense. I don’t think people who’ve never been teen girls realize how much subtle resistance goes on, or how much outright resistance. I can’t even tell you the number of times my cousins who had boys told my Mom she was so lucky to have had girls, because they must be easier. All my Mom ever did in response was roll her eyes, and occasionally laugh bitterly. Overall I highly recommend this book to readers of all genders, and most ages. Granted, you will have to read the other three first, or big chunks will make NO SENSE. But I think that’s a “hardship” you could all bear. All four of these books are well-written and entertaining. I didn’t want to put them down. I’m looking forward to picking up Scalzi’s take on H. Beam Piper’s world of Little Fuzzy after we finish moving. So, yeah, if things get a little quiet around here, that’s why. Next weekend is the big push. After that, we should be back to normal, more or less. Glad that I could help! Scalzi is definitely one of the better authors in SF these days. Or ever. He’s like a less self-important Heinlein, or something.